German Shepherd aggression can have various causes as discussed below, yet regardless of the cause of your dog's aggression you need to address it NOW or it will get much worse! There are very, very few situations where dog aggression resolves without that we change something in our own behavior. "I want to stop dog aggression, not change my own behavior!" - this often is the reply of unsuspecting dog owners. And while your dog will change his or her behavior over time, if you desire a targeted change - like to stop dog aggression - then there is no change in dog behavior without a change in your own behavior. And UNaddressed German Shepherd aggression is very serious: legally, financially, eventually. In the beginning, scary for you. In the end, dangerous for others and for you. To stop aggression, you must first identify the CAUSE of the dog aggression. Most times, dog aggression is caused by lack of socialization during puppyhood! There is no scientific evidence that you can give up on a dog arguing the dog aggression is caused by heredity. Generally, and particularly for the German Shepherd with this breed's extreme need for ample socialization, dog aggression is always caused by present or past behavior, not by genetics. In addition to identifying the CAUSE of your dog's aggression, also helpful is that you understand that in a dog's living environment certain factors contribute to dog aggression, while other factors help to mitigate dog aggression. Simply said: In the wrong environment every dog can become aggressive, just like every person too! Dehydrating the dog - either by withholding fresh drinking water or by feeding dry dog food! Be aware that none of these aggression contributing factors individually and as a one-off will trigger dog aggression, but a dog exposed prolonged or frequently to any of these factors may develop aggressive behavior - particularly when the contributing factor goes in line with one or more of the CAUSES of dog aggression that you found listed above. The most common example: Out of ignorance more than out of incompetence, the dog owner failed to establish every family member as accepted Pack leader for the puppy (see 3 above), and by the time the puppy is a BIG strong adult German Shepherd the resulting conflict in the Pack from the dog's viewpoint (see 4 above) causes the dog stress 24/7 (see 2 above). If on top of all this comprehensive puppy socialization (see 1 above) has also been missed - as is typically the case - then no wonder the dog is aggressive! There you see: Dog aggression often has several causes, all of which add up and ultimately become a major problem. So don't wait too long when you suspect that your GSD is showing dog aggression in some situations, but in others is still calm and friendly. Got a German Shepherd? - Relax! Despite what many photos of a GSD with fledged teeth seem to suggest, GSDs are not prone to aggression. A German Shepherd from the right source that has been treated and trained well will only (possibly) show aggression when the GSD feels that there is an attack on the dog's accepted Pack members (say your family). Remember that a GSD's genetic heritage is that of a guard dog for herding cattle. Herding dogs are least likely to show aggression. Now what if you are facing German Shepherd aggression right now? Then you may be looking for some dog aggression training right now. That's a foolish term though, dog aggression training. It doesn't make sense to try to train a dog to be less aggressive. Instead we have to remove the CAUSE of the dog aggression. 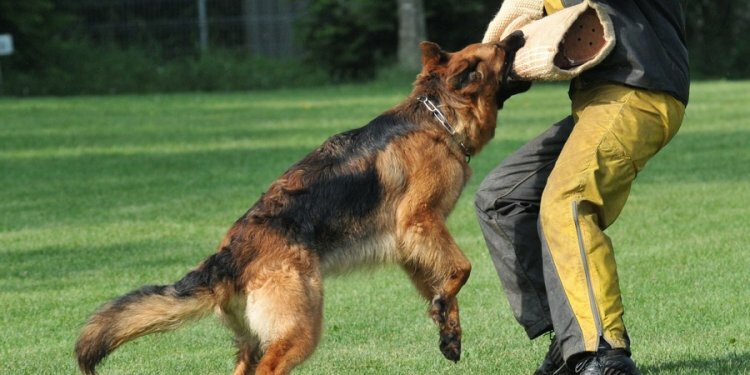 This is why our article here straight away started with the Causes of German Shepherd Aggression, and then further elaborated on the Dog Aggression - Contributing Factors. So, have you identified what is CAUSING your dog's aggression? And have you identified all the factors contributing to your dog's aggression? Fine. Now you need to address the aggression causes, and to remove the contributing factors, one by one. But you won't even need to address all of them, no worries. Start with the one CAUSE that you feel is the most likely cause of your dog's aggression. Say, you believe lack of socialization during puppyhood is the prime CAUSE of the dog aggression. Then start today to make up for that: Socialize your German Shepherd comprehensively. Utmost! One cannot socialize too much. Seize every chance that daily life offers you: on walks, with neighbors, when you go shopping, everything! Except when you meet stray dogs. Don't have your GSD socialize with stray dogs. Then also address the three aggression contributing factors that you feel are most likely affecting your dog's behavior. Eliminate them, one by one. THIS is what you need, not what you were looking for when you searched for dog aggression training or whatever. From all the reported "dog problems" here, over the past years I learned that almost all what dog owners are looking for in terms of dog health and dog training, is not what they need. We won't service your wants, sorry. But you will get a LOT of what you need for your GSD once you are subscribed to our free Periodical. And preventing dog aggression of course is a topic too in the MYGERMANSHEPHERD PERIODICAL.